My old pillow covers were gross. They live on the floor 90% of the time because for some reason pillows are meant to be thrown on the floor by little boys + husband…so it was time for new ones. 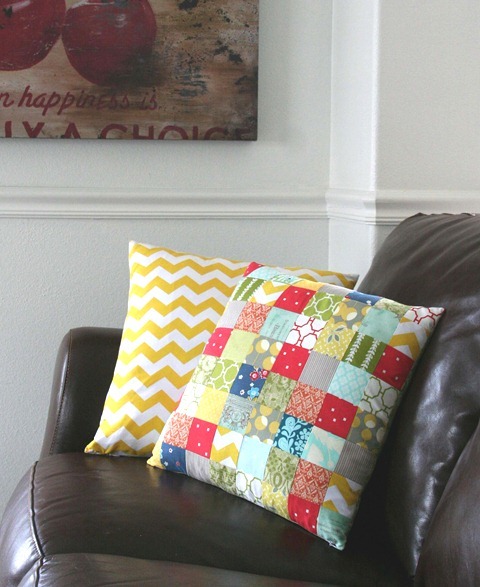 It’s a fun quick project and I forget how much I enjoy looking at new pillows on my couch, plus that patchwork pillow was all scraps…gotta love that. I used this tutorial to install an invisible zipper in them so they can go into the wash often. cute pillows! i love quick and easy projects for the house! I love the pillows! This is definitely a project I need to undertake as we have the same issue at our house… except it is big boys! I love the foil of the bright pillows against a leather sofa any day! So cute! I was just thinking last night about how our couch desperately needs some new pillows too! So bright and cheery. Looks great! What wonderful pillows! I raised three sons and I understand completely! They think couch cushions and throw pillows are for building forts and having pillow fights! That's so funny. That's exactly where my pillows live their lives. What is it about boys and pillows. I'm starting to think I should just give away the couches and make floor cushions. Maybe I wouldn't be the crazy lady screaming about her pillows being on the floor all the time. Great pillows! Yes- what IS it about kids and pillows on the floor??? These are very cute (and washable!). How cute! Now, I want to make new covers for my pillows. My hubby and daughters seem to think ours belong on the floor too. Love it! I adore pillows. My hubby hates them. MEN! What do you use for a pillow form inside? They are very pretty. Thanks for sharing! Just lovely! The yellow zigzags are great. My couch is in desperate need of some pillows! Your pillows are so lovely. I love the chevrons…where did you find the fabric?? great to work with. I've been using Kona in my embroidery work. I really like your yellow zig-zaggy fabric. I love them! I have been on a pillow making kick myself. I have been making all my pillows with an envelope style back, but I think I will try the zipper now. I've done zippers a few times…they really aren't that difficult. I have already made several of my Christmas gifts and a couple were couch pillows for my dad. I recycled some old bed pillows. Just cut the end off and took out the old stuffing, refluffed it, and then stuffed the +heck+ out of the new pillow I made with muslin. The kids helped. I like pillows extra firm! Love the happy colors your chose. I'm glad it's not jus me then – my kids are always chucking pillows on the floor and I'm forever putting them back again. I think we are due for some new ones too. And your couches look the same as mine so I'm pleased to see these bright colours looking so fab against the chocolate brown leather!! You make the best stuff! What size squares did you use? BTW, I forgot to say how much I loved the cushions! 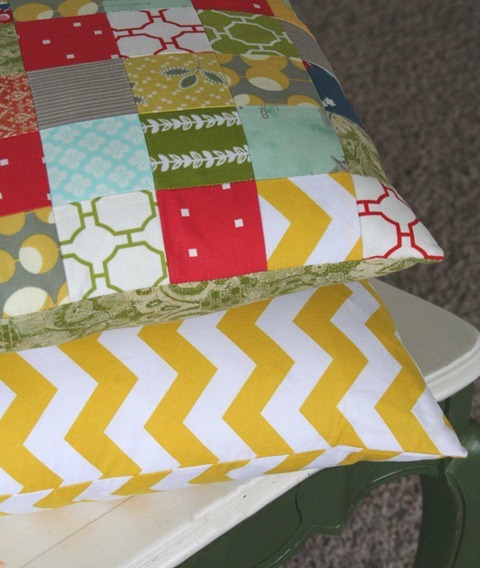 Did you quilt the top of the pieced pillow or put a lining on it? Just wondering if there's some secret tricks that I don't know about! I love pillows. I don't know why I don't make them. They are so darned expensive to buy! The yellow chevrons are really fresh. They may bring me out of my war on chevrons. Maybe. Do you mind if I ask where you got your happiness picture in the background?? I love that picture but I have no idea where to find it! Love the patchwork — they'll be nice and summery during the winter! Males! I hope they like your new cushions, they are just gorgeous. Those look great! And ditto about the pillows on the floor! My boys (and husband too) do the same thing, I finally told my four year old he's on permanent pillow duty, which lasted for about a day before he realized it wasn't fun, haha :).